The first column shows the year awarded, the second column shows the name of the recipient, and the third column describes the honor given to them. 1991 Shirley G. Carter Shirley G. Carter Memorial Award. This is a chapter-level award to assist college students in the Washington, DC metropolitan area who are pursuing established degree programs in some area of technical communication and have completed at least one year of post-secondary education. As of 2010, awards are given to the Best Student Entry in the chapter's Technical Communication Competition. 1989 Austin T. Brown The chapter's High School Science Writing Contest Scholarship was renamed as the Austin T. Brown Technical Communication Award. (The fund was started in 1962.) This is a chapter-level award for high school students in the Washington, DC metropolitan area to encourage the development of technical writing skills among students in grades 10, 11, and 12. As of 2010, awards are given to the Best Student Entry in the chapter's Technical Communication Competition. Tribute Marian Norby Scholarship. STC established this scholarship in 2007 as a bequest of Marian Norby. The scholarship was for full or part time U.S. federal government females who work as a secretary or administrative assistant and are interested in studying for a degree or attending a continuing education or training course related to technical communication. 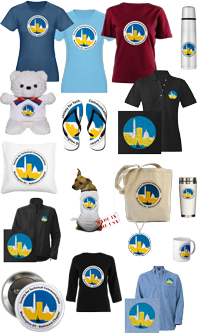 The scholarship was suspended in 2013 and converted into the Marian Norby Legacy Society that collects funds when STC is named as a beneficiary in your Will or Trust, your life insurance policy, or your tax-deferred retirement account. 2004 Dr. Janice (Ginny) C. Redish STC President's Award—"For your unstinting contributions of expertise, time, energy, and commitment from the earliest days of the STC Transformation effort." 2002 Alice Philbin, Ph.D., James Madison University, Harrisonburg, VA J.R. Gould Award—"For the time and resources she devoted to making sure that her students received the education that would benefit them the most." 2002 Mary R. Wise STC President's Award—"For your long-time dedication and unconditional service to STC, and especially for your involvement with the implementation of our new brand." 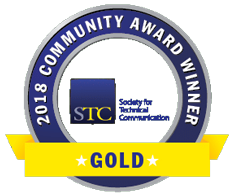 High School Communication Award STC President's Award—"For years of dedicated service to the Society, for his passion as a leader at the Society and chapter levels, and for his wisdom as a teacher and mentor." 1996 Annette Reilly STC President's Award—"You are the ideal volunteer, always generously giving of your knowledge, time, and energy and never taking the much-deserved credit. STC is enriched by your contributions." Tribute STC President's Award—"In recognition of her sustained and dedicated effort in managing a vitally important Society committee, and for contributing to the quality of member newsletters." Marian served as the Manager of the Tellers Committee for over 16 years. 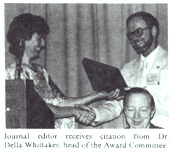 1983 Dr. Della A. Whitaker Della A. Whitaker International Scholarship. This was a Society-level scholarship to assist college students who were pursuing established degree programs in some area of technical communication and had completed at least one year of post-secondary education. Two awards were granted to graduate students, and two to undergraduates. The scholarship was suspended in 2010. Chapter Memorial Award Director–Sponsor, Region 3. Shirley was the first African-American female elected to the STC Board of Directors. Tribute President of the Society. Peter was among the first in STC to emphasize the need to attract young students to the profession. In the early 1960s, he helped establish, promote, and implement the Washington, D.C. chapter's Science Writing Contest for high school students in the Washington Metropolitan area. In the late 1960s, Peter played a key role in the establishment of what has become a major society program: publications competitions. After conducting a successful chapter-level competition, he was asked to help organize and guide the first Society-level publications competition.